John Muir and Theodore Roosevelt at the Grizzly Giant, Mariposa Big Tree Grove, 1903. Photograph by Joseph N. LeConte (1870–1950). Left to right: Two Secret Service agents, Secretary of the Navy William Henry Moody, California Governor George Pardee, Roosevelt, Dr. Presley Marion Rixey, Muir, Nicholas Murray Butler, Presidential secretary William Loeb Jr, and University of California president Benjamin Ide Wheeler. Image courtesy of the Sierra Club. This month—on August 25, 2016, to exact—the National Parks Service celebrates its centennial. At the time of its founding, there were already a dozen national parks, including the first, Yellowstone (established in March 1872) and some thirty national monuments, such as Devils Tower in Wyoming, the Gila Cliff Dwellings in New Mexico, and other “historic landmarks, historic and prehistoric structures, and other objects of historic or scientific interest” protected by the 1906 Antiquities Act. The 1916 law brought all these areas under the umbrella of a single agency, which today manages 59 national parks, 82 national monuments, and several hundred other preserves, recreation areas, and historic sites. 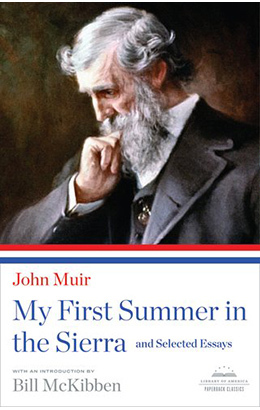 John Muir, who died two years before the founding of the NPS, is widely considered one of several men responsible for its creation. For four decades Muir published articles in the national press urging protection of such natural wonders as the Petrified Forest, the Grand Canyon, and—above all—Yosemite. In 1889 Muir met Robert Underwood Johnson, associate editor of The Century Magazine, and the two men traveled to Yosemite in early June. They were alarmed to find substantial damage caused by lumbering, sheepherding, and tourism. Muir agreed to write two articles for the magazine proposing the creation of a Yosemite national park, and Johnson returned to Washington to lobby Congress. In October 1890, largely in response to the public debate that resulted from the Century articles, Congress passed legislation creating a park that was even larger than the one Muir had proposed. Muir also played a significant and persistent role in saving several forests of giant sequoias (Sequoiadendron giganteum), which include the largest trees in the world, and of coastal redwoods (Sequoia sempervirens), which include the tallest trees in the world. One location was the North Calaveras Big Tree Grove, the first group of sequoias encountered by white settlers. On February 25, 1900, The San Francisco Chronicle published an article that was widely reprinted in the national press. “THE CALAVERAS BIG TREES: Cry of Alarm from California that the Entire Grove May Be Sold and Cut Down for Lumber” ran the headline in The New York Times. For the previous forty years, James Sperry had owned the land, operating a hotel for tourists and protecting the nearly 100 giant sequoias in the grove. (The South Grove, which was not nearly as accessible, hosts another 1,000 trees.) Now seventy-five years old and unable to pay for its maintenance, Sperry needed to sell his land and had been trying to “see the great trees preserved as a public park.” Instead, Job Whiteside, a lumberman from Wisconsin, put down a deposit for the grove, with a 90-day option to come up with the remaining money. Because of the public outcry, Congress passed legislation almost immediately, authorizing the Secretary of the Interior to negotiate for the park with its new would-be owner. It was around this time that Muir wrote the brief essay “Save the Redwoods,” arguing that Americans should save the scattering of sequoia groves outside the already-established Sequoia National Park, as well as the forests of redwoods along the coast. In the opening paragraph he recounts the demise of the two most famous trees in the North Grove. The Discovery Tree, the first giant sequoia seen by white settlers, was cut down shortly after its discovery in 1852, and its stump was used as a dance floor and, later, a bowling alley. The immense Mother of the Forest, stripped of its bark in 1858, soon died and was destroyed by fire in 1908; the 100-foot stump—about a third of its original height—still stands. As it happened, after Muir wrote this piece (which was found among his papers after his death), Whiteside refused to sell his new purchase to the federal government. Upset by the way he had been portrayed by the national press, however, he agreed that the sequoias would be preserved, and his family moved into the hotel and continued to operate Sperry’s tourist business. 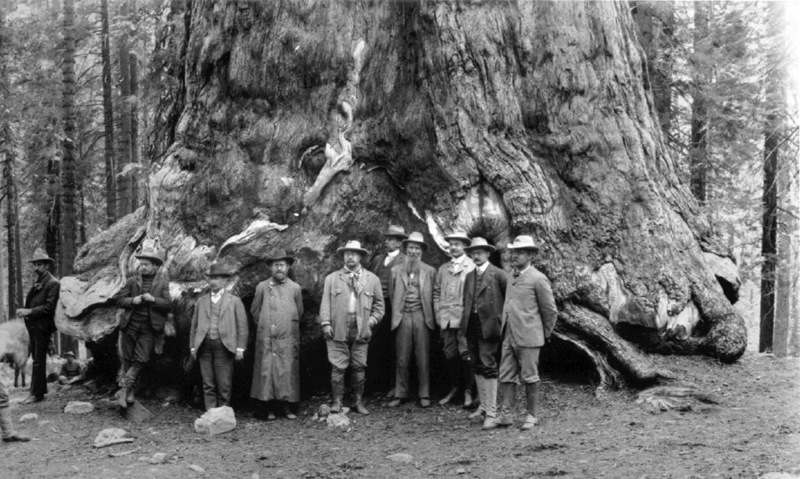 In 1908 President Theodore Roosevelt (who, during his first term in office, had accompanied Muir on a camping trip through the Yosemite area) was authorized by Congress to exchange federal land for the grove and create the Calaveras Big Tree National Park—but Whiteside again refused to give up the land. Although most major sequoia and coastal redwood groves (including Muir Woods National Monument) were eventually gathered under the jurisdiction of the National Park Service, the Calaveras groves proved an exception, remaining in private hands until 1931, when it became Calaveras Big Trees State Park. Whiteside’s stepson served as the park’s first warden. Note: On the third page of “Save the Redwoods,” the editors of the Sierra Club Bulletin, which first published this piece in 1920, mistakenly inserted the year 1905, apparently confusing state legislation transferring control of the Mariposa Grove to the federal government on March 3, 1905, with the Calaveras Grove bill approved by the U.S. House on March 3, 1900. We are often told that the world is going from bad to worse, sacrificing everything to mammon. . . . If you don't see the full selection below, click here (PDF) or click here (Google Docs) to read it—free! The cutting down of the majestic Sequoias should be a felony! And the government (Party) that allowed the sale of these groves needs to be 'outed' for destroying them. Let the American people know what they have done and who did it and they will be the judge!